The market is segmented by Aircraft Seating Class (Economy Class, Business Class, First Class), Flight Service Type (Full-Service Carriers, Low-Cost Carriers, Hybrid & Others), Food Type (Meals, Bakery and Confectionery, Beverages, Others), and Geography. 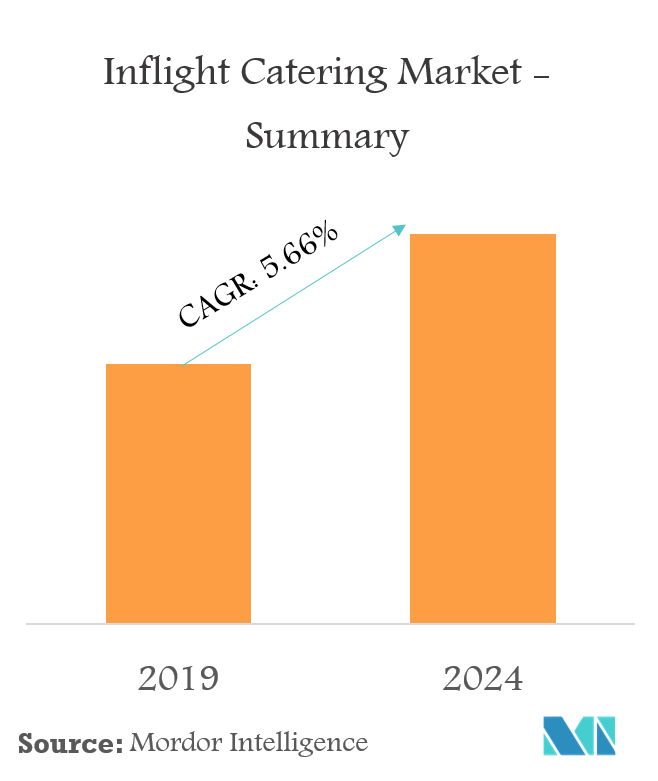 The inflight catering market is anticipated to witness a CAGR of 5.66% during the forecast period. 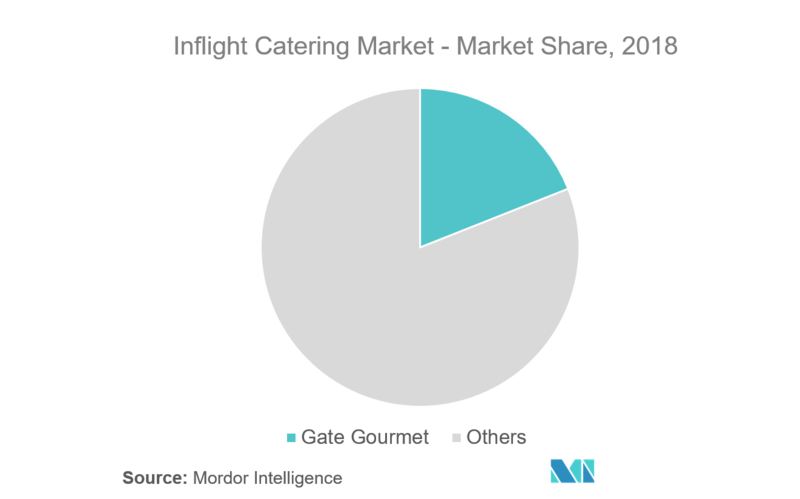 The growth of inflight catering market is largely dependent on the development and growth of the aviation industry. Integration of technology for the ordering of food and beverages on-board is expected to help the growth of the in-flight catering market. Also, concepts like retail on board and personal in-flight chefs are anticipated to affect the in-flight catering market in the near future. An airline food, inflight meal, or airline meal is a meal served to passengers on board a commercial airliner. Specialist airline catering services prepare these meals and usually serve to passengers using an airline service trolley. Meals are expected to be the dominant food type in the inflight catering market during the forecast period, due to the demand from the Asian and European airlines. There was a growing preference from the passengers in these regions towards meals, especially in long haul flights. Some airlines in the North American region serve meals that are available, at an extra cost. However, the beverages segment is expected to obtain the highest growth rate during the forecast period. Strategies like the introduction of beverages like premium wines to lure the business and first class passengers have shown positive results to the airlines, and this is expected to help the growth of the beverages segment during the forecast period. Asia-Pacific is a vast inflight catering market in terms of culinary habits, and passengers from different regions vary in their culinary preferences. Though India and China are neighboring countries, the culinary food habits of people in these two regions are significantly different. Food habits of passengers from the north vary from those of the south in the same country. 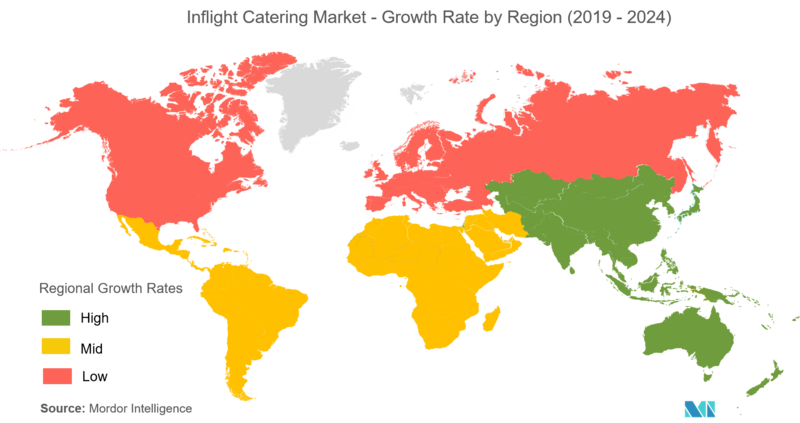 These variations are likely to help the catering suppliers invest more in these diversified menu types, thereby leading to the high growth of the region during the forecast period. Five major players dominate the market for inflight catering. However, when it comes to supplying from small and medium-size airports, the market is fairly fragmented with the presence of regional players. Demand for food with high quality and safety was the main reason for airlines to prefer the catering from major manufacturers than the regional players. Further, these big players have increased their R&D spending exponentially to integrate the innovation with culinary excellence. This has resulted in premium quality food for airline inflight catering.. Gate Gourmet, LSG Sky Chefs, and SATS are some of the leading companies in inflight catering market. Custom Study can be provided according to the client requirement*. Example: The split of By Food Type and By Flight Type for each region along with Regional Competitive Landscape. *The custom study will be charged separately. 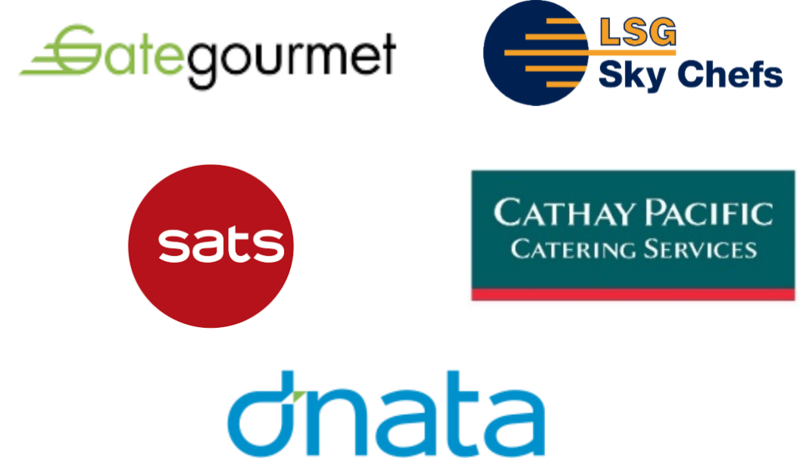 6.4.4 Cathay Pacific Catering Services (H.K.) Ltd.